In 1951 Burlington, Colorado farmer James Nelson Gernhart pulled a variation of the old “Tom Sawyer” and held a rehearsal of his own funeral. The trial run consisted of eight pallbearers carrying a casket from his home to a waiting hearse, they then attended it to the local armory, where almost half of Burlington, Colo., turned out for a funeral sermon by the Rev. S.H. Mahaffey. The local newspaper also published Jim’s obituary. 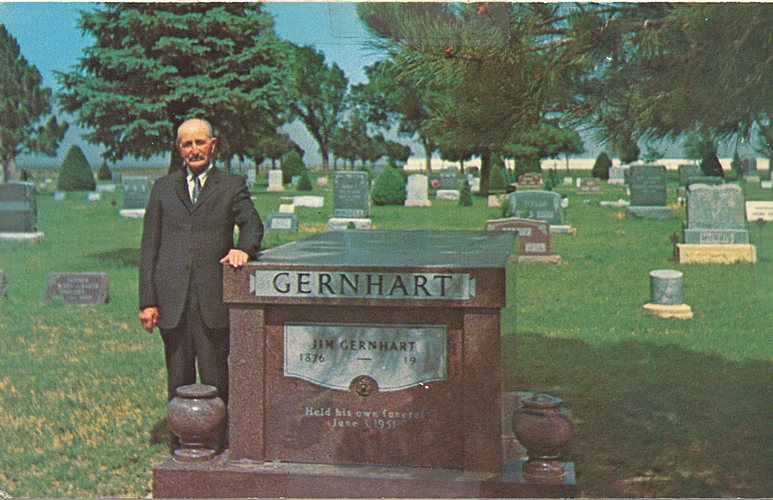 Jim Gernhart continued to gain fame by holding annual funerals drawing even more attention from the media. His “last” funeral was held in 1980 after his death at the ripe old age of 103.